Over 50 participants took part in the SDIP partnership workshop. They included senior officials, researchers, academicians, development practitioners, development partners and knowledge experts from both the government and non-government sectors. Through the Sustainable Development Investment Portfolio (SDIP), supported by the Department of Foreign Affairs and Trade, the Government of Australia, ICIMOD aims to improve regional evidence-based knowledge on critical challenges faced by transboundary river basins in the Hindu Kush Himalaya and offer solutions through a river basin approach. What is a river basin approach? The approach strikes a balance between commonly competing elements, namely, natural resources use, social development and conservation of the environment. River basin management based on integrated water resources management and nexus approaches targets the optimization of benefits to humans and ecosystems by equitably balancing water resources use, the economic development of basins and environmental conservation. Group discussion in the workshop. The second phase of the SDIP, which was renewed in June 2016, will continue to focus on ICIMOD’s aims to generate enough knowledge to feed into regional networks and forums while promoting science diplomacy in the policy processes. The Indus is one of three river basins – the other two being Koshi and Brahmaputra – where ICIMOD is working with partners through the SDIP. The workshop in March 2017 was aimed at concretizing the ideas generated during a workshop held on 4 August 2016 when ICIMOD with PCRWR and WWF led the initiative for developing partnerships. 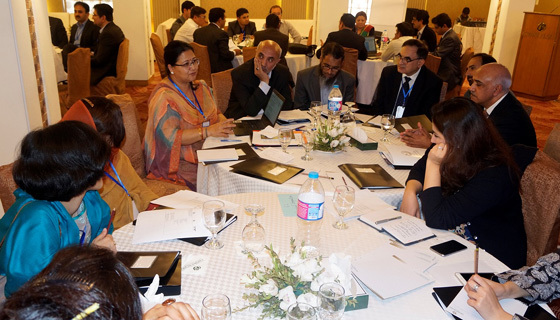 Participants of the March 2017 workshop said that the event helped create a good platform on which to prepare detailed implementation plans for SDIP-2. They explained that the challenges faced in the Indus basin are quite complex and that knowledge gaps in particular present a problem. They added that forums such as the workshop facilitate direct communication between researchers and policy makers. “We will continue supporting ICIMOD’s initiatives in Hunza and Gilgit Baltistan, where we have been working with ICIMOD on mountainous agricultural research in the Indus basin,” said senior government official and Chairman of Pakistan Agricultural Research Council (PARC) Yusuf Zafar, who presented his welcome remarks during the opening session. The technical sessions of the workshop included individual presentation pathways for change and gender integration in SDIP-2. There was also a group session on proposed activities for 2017. One of the key outcomes of the workshop was active interaction between participants from diverse professional and thematic backgrounds. Eventually, a comprehensive implementation plan was drawn up (details will be included in the Indus Basin Initiative’s workshop proceedings report out in April). “Knowledge is the only difference between the progress of the first and third worlds, and we have huge knowledge gaps in our region,” said Muhammad Ashraf, Chairman of PCRWR. He added that strengthening knowledge was vital to supporting the decisions of policy makers. Like other Himalayan basins, the Indus also faces serious challenges related to huge knowledge gaps and poor attention to the water-livelihoods-gender nexus. Given that climate change demands critical knowledge generation, creating an enabling environment for regional cooperation in the HKH and downstream river basins is crucial. These challenges are even more prominent in the upper Indus basin where organizations need to make more collaborative efforts. “ICIMOD is playing a key role in filling these gaps using a partnership consortium approach,” said Ghulam Rasul, Director General of the Meteorological Department (PMD), Pakistan. He said that the effort could help deprived upstream communities the most. ICIMOD has been facilitating the regional science ‘Upper Indus Basin Network’ since 2012 to promote collaboration among organizations to improve understanding of the basin’s present and future water availability, demand and hazards, and to develop solutions for various stakeholders from the local to national levels. “One of its key aims is to address existing knowledge gaps and to ensure that there is no duplication of research in the basin,” said Arun B Shrestha, ICIMOD’s Regional Programme Manager of River Basins. Integrating gender inclusion was also a significant part of the workshop agenda. “Gender-responsive knowledge systems will be identified and promoted. This will provide solutions for empowering women and disadvantaged groups to inform policies and programmes,” said ICIMOD’s Gender, Water and Adaptation Specialist Pranita B Udas. Concluding the workshop, Babar Khan who heads WWF Gilgit-Baltistan’s office shared that the workshop participants represented various regions of the Indus basin – from Islamabad to Lahore and the rural parts of Gilgit-Baltistan – and provided valuable inputs to develop concrete ideas for a strategic plan for 2017. The presence of government representatives from the federal and provincial governments helped enhance the agenda of the forum.